Now is your chance to chat with Vinny, author of the amazing book, How to Beat Casino Surveillance published by BJI. On June 14th at 9pm ET you can join a FREE chat room and chat with BJI writer Vinny DeCarlo, author of the new BJI published e-book How to Beat Casino Surveillance. You'll also be able to email your questions to Vinny beforehand (he'll answer them during the chat). If you want to e-mail your questions in advance of the online chat, do so here: VinnyChat@bjinsider.com. Bookmark this url and use it to go to the online chat room on June 14th at 9 pm ET: www.bjinsider.com/VinnyChat. If we get a good turnout, we plan to schedule more chats. 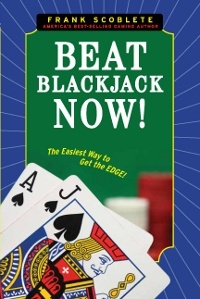 Congratulations to BJI contributing writer Frank Scoblete whose new book Beat Blackjack Now! was just published. For details on the contents of the book, read Frank's Atlantic City Report. Congratulations also to BJI contributing writers Ken Smith and Timmer for finishing first and third respectively in a recent blackjack tournament. Ken is on quite a roll. In recent casino contests/promotions, he also won a $50,000 automobile (his second car won in 18 months!) and $30,000 in cash. In this issue of the BJI, Vinny DeCarlo summarizes the top 10 diversionary tactics that card counters can use to stay under the casino radar and win more (some unique tips). Stroll down memory lane as Basil Nestor retells the story of how basic strategy was invented, and how that strategy reveals a lot about today's blackjack game (must reading). Does your blackjack game need a tune-up? Joe Pane will make your game more fuel-efficient. John Grochowski answers more reader's questions on blackjack including this interesting one: "If the house edge on a six-deck blackjack game is about a half percent, and the house edge on a 9-6 Jacks or Better video poker game is also about a half percent, will I do better betting $5 a hand in an average one-hour session in blackjack or video poker?" Mr. Kevin Brown, Executive Director of Table Games at Resorts Atlantic City Casino, took issue with an article that appeared in the April issue of BJI on the hand-fees on their $2 blackjack games. In this issue, Mr. Brown provides his response to questions that we subsequently sent him about their game. You can get the details on Frank Scoblete's new blackjack book (Beat Blackjack Now!) in his Atlantic City Report, as well as the latest scoop on the AC blackjack playing conditions. Craps tournaments can be very lucrative... read Ken Smith's article for the basics on how to get the edge over your opponents. Sammy Vaughn reminisces about a famous Stardust Blackjack Tournament and the well-known tournament players who played in it (you may recognize some of those players). Everyone likes to hold kickers when they play Texas Hold'em. However, poker pro Bill Burton explains the importance of when to hold kickers and when not to. Last, but not least, we have a schedule of major blackjack tournaments for June/July courtesy of blackjacktournaments.com. Note: Ralph Sticker's column ("How and Where it Began") will resume next month. E-mail subscribers can also read each month's issue online at our web site: BJI Issue #125, June 2010. You can beat the game of blackjack! Go from a traditional blackjack player to an advantage player with a real edge over the house in several easy-to-master steps in this breakthrough book. 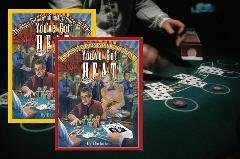 Beat Blackjack Now is the only blackjack book you'll need to beat the casinos. This book can take you from a novice to an expert player! "Here for your reading pleasure is the top 10 ways to increase your odds of winning by using diversionary tactics and striking the enemy when they are at their weakest. Keep this confidential..."
"It was a humble little article published in the Journal of the American Statistical Association, eleven short pages titled "The Optimum Strategy in Blackjack." The year was 1956. Most of the article was filled with mathematical notations, the sort of longhand formulas typical in an era when a single computer would fill an entire room and statisticians did calculations on slide rules. Nobody knew at the time, but that arcane little treatise would rattle a multi-billion-dollar industry..."
"If the house edge on a six-deck blackjack game is about a half percent --- I play basic strategy --- and the house edge on a video poker game like 9-6 Jacks or Better is also about a half percent, will I do better betting $5 a hand in an average one-hour session in blackjack or video poker?..." "Is your blackjack game fuel-efficient? Alternatively, is your game one that guzzles your money away just like a Hummer guzzles its owner's money on fuel..."
"Mr. Kevin Brown is the Executive Director of Table Games at Resorts Atlantic City Casino. Mr. Brown took issue with the article that appeared in the April issue of BJI on the hand-fees on their $2 blackjack games. This is his unedited response to questions that we sent him..."
"Read about Frank's new book Beat Blackjack Now! and also get the scoop on the latest blackjack playing conditions in Atlantic City..."
"If you are coming from a background of playing blackjack tournaments, this is a difference (in craps tournaments) that you're going to absolutely love! Very much unlike a blackjack final hand, if you have the lead in a craps tournament and are able to bet behind a single opponent, he cannot beat you. If you simply make the same bets that he does, you'll win no matter what number rolls. That's a powerful situation, and it alone accounts for much of the huge value these events hold..."
"The great game ... Stardust old style. It was $600.00 live money, 60 hands, with standard good playing rules and $5.00 to $300.00 betting limits. There were no gimmicks or carnival tricks. Players had liberal time limits to make their bet. Usually, good dealers dealt in the tournament. The only thing that was missing was the surrender rule..."
"There are many times when a kicker determines the winning pot. Often time players don't think about it until they lose one of these hands. You must consider your kicker when choosing your starting hands..."